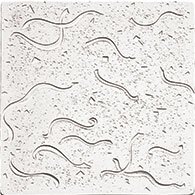 Description A 12" square plaster mold containing a design resembling confetti. To transfer the design to your clay slab, place slab on mold, and either use a heavy clay roller, or press firmly with your hands. Remove clay from mold and shape into any form you desire.